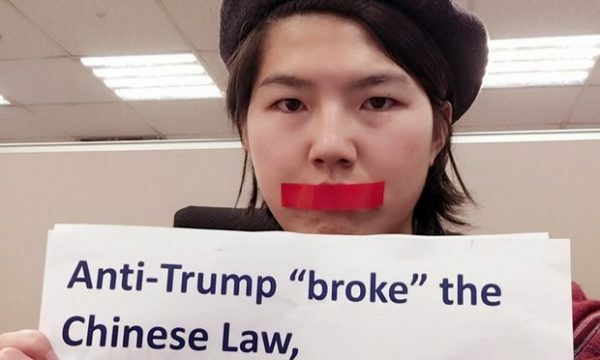 A leading feminist blog account with 80,000 followers has been closed down in China for voicing criticism of US president Donald Trump’s racist and sexist policies. Sina Weibo, China’s equivalent of Twitter, closed down two accounts operated by ‘Feminist Voices’ for 30 days on Monday. The action was taken after the group made several posts in solidarity with the global initiative for a ‘general strike’ by women (also known as ‘Day Without Women’) on 8 March, International Women’s Day. Women’s strikes are reportedly planned in over 30 countries. That this initiative should reach China, where strikes are banned and street protests swiftly put down, is very significant. “We are guessing that it’s because we sent out some tweets calling for a women’s strike action against Trump,” said Xiong Jing, an editor of ‘Feminist Voices’. The group had not been told the specific reason for the ban other than that recent posts had “violated” state laws, she told the US-funded Radio Free Asia. The Chinese dictatorship is increasingly nervy over all forms of protest especially in a year when ‘core leader’ Xi Jinping faces a crucial leadership reshuffle through which he seeks to consolidate his grip on state power. Recent years have seen a deepening crackdown with mass arrests of worker activists, rights lawyers and those ‘spreading rumours’ on the internet. New laws have been introduced in the past year to increase control over NGOs and tighten rules for social media. As reported on chinaworker.info, state censors issued instructions in January to ban “unauthorised criticism” of the Trump administration, reflecting Beijing’s fears that this issue could become a flashpoint for unrest in China. Almost exactly two years ago, five feminist activists were arrested in China for planning protests on public transport against violence against women. The five were released after worldwide protests in what was a rare climb down by the Chinese regime. These activists are still charged and under constant state surveillance. 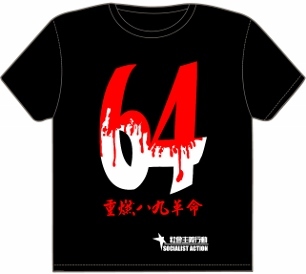 The action against ‘Feminist Voices’ follows a similar pattern in that it comes in the run up to International Women’s Day and the annual meeting of China’s pseudo-parliament, the National People’s Congress (NPC). Women’s rights campaigners along with others in China have been inspired by the historic 4 million-strong women’s marches against Trump in January. 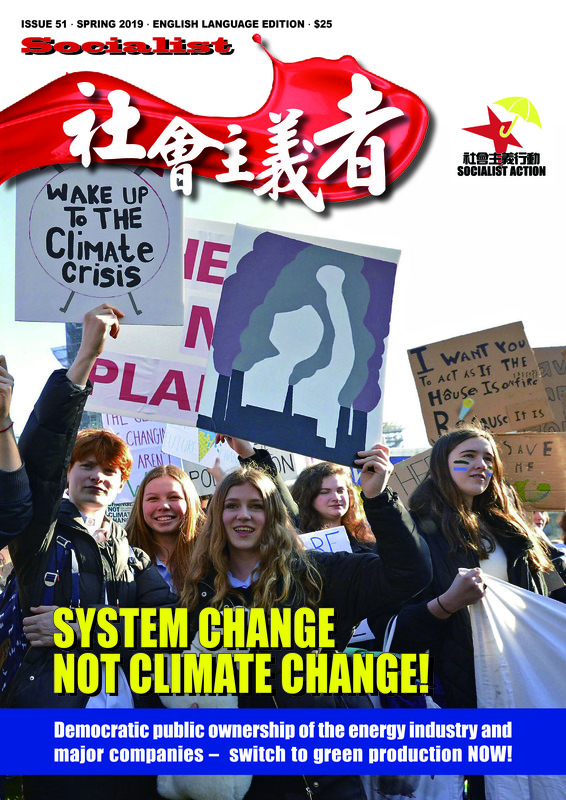 ‘Feminist Voices’ has posted in support of the international strike on 8 March and translated into Chinese the article, which first appeared in the Guardian newspaper, by US-based feminists including Angela Davies which called for a “new wave of militant feminist struggle”, particularly targeting Trump’s “aggressively misogynistic, homophobic, transphobic and racist policies”. Li Tingting, one of five feminists detained in 2015, told RFA, “There is considerable momentum around the women’s rights movement, and the public opinion supervision authorities have been censoring it ferociously.” She saw this as “part of an overall clampdown across the board,” by the Chinese regime. The Chinese authorities’ reaction (Sina Weibo and other media companies act as enforcers for the Chinese government) shows the huge global impact of the ongoing mass resistance to Trump and the upsurge in women’s activism which predates his government – with standout examples of mass women’s struggle in Poland and Argentina last year. While there are special factors in China, with its zero tolerance of independent political movements, the case also shows how the political establishment worldwide is deeply worried that Trump and his political agenda can destabilise world relations and radicalise societies – women, trade unionists, migrants and ethnic minorities – outside the borders of the US. chinaworker.info (which is banned in China) and the Chinese supporters of the Committee for a Workers’ International (CWI) are organising protests against the ban on ‘Feminist Voices’ and also planning demonstrations and meetings in solidarity with the international women’s strikes and against Trump’s racist, sexist, extreme right wing agenda on 8 March. This can be an important rallying point along with proposals for strike action by US workers on May Day, 1 May, for building the fight back against billionaire rule in the US and globally. 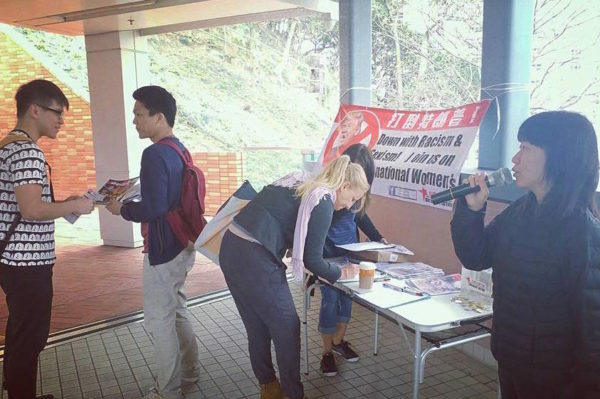 Campaigning for International Women’s Day at a Hong Kong university.